Is Club Penguin to slow? Or maybe your in a igloo, with lots of stuff in it, and things are just moving way to slow! Well here's how to fix it! All you have to do is push the +/= button on your key board! 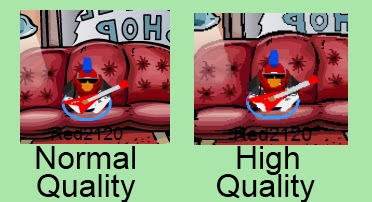 By doing that, it will adjust the quality on Club Penguin, making things faster! But when you adjust the quality, it may make things look "bad". Check it out! If it's not changing quality for you when you are pushing the +/= button, try pushing it while your penguin is walking. AWESOME!!! The HD one looked much better! Thanks for the glitch Red!